Emailing made secure with SSL techniques! With time, technology revolutionized worldwide, so did the email services. Sending an email now is just a one-click task. Earlier it was a complex and a time-consuming task which required both, sender and receiver to stay online at the mail delivery time. But now things have changed. Many platforms have come up which assure you the best email services enframed with the latest techniques and strategies. So we get endless options in the market to choose the best service for our emails. But it doesn’t end just here. The thing to bother is that whether these platforms are providing us a framework which is secure from hacker attacks and does they safeguard our data or not? Right. There is software which offers us many interesting features of their product but has no security measures built in their architecture. We exchange our private data on a daily basis and it's just not safe over a platform which doesn’t offer any SSL or TLS or any encryption features to us. There seems an urgent need to have an SSL (Secure Socket Layer) based platform to safeguard our credentials, passwords, financial transactions, account details, personal files and other delicate data which we exchange over the internet. SSL is the perfect concept which can address this issue along with offering other services. SSL basically deals with building and enhancing the trust with your clients through some strategies which makes it different from the other security solutions. It ensures that the communication between the sender and receiver remains private and intrinsic. Once we send an email, it goes through numerous networks during its pathway and then reaches the final destination. During this whole passage, there might be a hacker trying to peep into your data. What now? 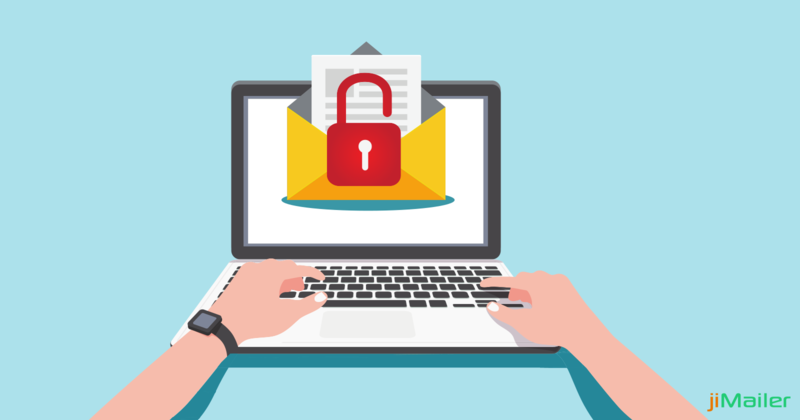 SSL rescues the problem by adding an encryption scheme which will allow only the defined sender and receiver to view the content of the email. Whenever any third party source attempts to attack or view your content, they simply get the content in human unreadable form. The SSL certificate basically adds some random characters to the content and making it confusing to understand, which can only be viewed otherwise using the encryption key provided by SSL. Thereby, making it impossible for any hacker or false source to enter your personal space. So, there seems an urgent need to adopt a platform which has an SSL based architecture and safeguards your emails from these malicious practices. SSL made emailing safe and secure and technology on its top made SSL easily available to us as an in-built service. There have been several email service providing software that emerged with in-built SSL in their architecture. One of them is jiMailer. It is a perfect software platform that directly promotes a commercial message to a group of people using email with SSL already deployed in it to safeguard your private data at the most affordable costs and get the best experience. Safety of your Data is in your hands! !